uberVu provides Hootsuite with enterprise class analytics. uberVU’s technology aggregates, analyzes, and distributes real time social data. The solutions supports data sources such as blogs, forums, and social networks. HootsSuite intends to keep uberVU as a separate offering and integrate the products over time. Point of View (POV): Most big data and analytics solutions in the social and cloud space are misnomers. In fact, these solutions often provide simple, retroactive reporting and dashboards. The addition of uberVU will allow HootSuite users to gain real-time analysis and future industry specific benchmarking capabilities. 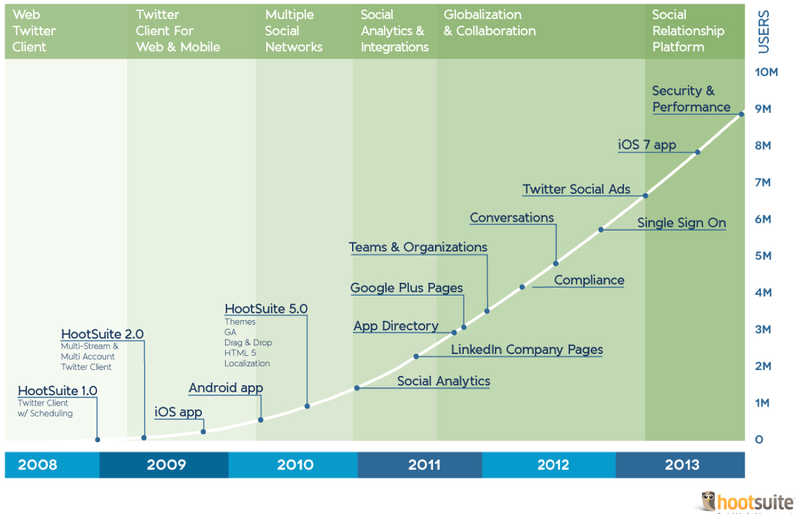 Moreover, Hootsuite has invested in an increasing set of enterprise features over the past three years (see Figure 1). This analytics acquisition marks a commitment to enterprise class features. HootSuite gains key clients. uberVU brings big brands and enterprise logos to HootSuite. Marquee names span across a variety of industries including Ariad, Dassault Systems, DDB, Fujitsu, Getty Images, Giant Eagle, Indiegogo, JDRF, L’Occitane, Method, NBC, Phillips, SC Johnson, Method, NBC, Phillips, and Wolverine Worldwide. (POV): Using globalization and in-depth industry thought leadership, the uberVU team had grown the company via international enterprise expansion. Most customers praised uberVU for a fair pricing model based on streams, not mentions. HootSuite intends to keep this pricing. Most HootSuite customers have had positive comments about the core social media management offering. However, a key area of opportunity has been better analytics. This acquisition provides a short term solution for existing customers. However, the true benefit arises when HootSuite integrates uberVU into the overall user experience. As a HootSuite customer are you excited about improved analytics? As a uberVU customer, do you have any concerns with the acquisition? Are you embarking on a digital business transformation? Let us know how it’s going! Add your comments to the blog or reach me via email: R (at) ConstellationR (dot) com or R (at) SoftwareInsider (dot) org. Posted in Business | Tagged acquisitions, analytics, Apps Strategy, Ariad, Business Analytics, Chief Marketing Officer, CMO, Constellation Research, CustExp, customer engagement, Customer Experience, customer service, CXP, Dassault Systems, Data to Decisions, DDB, enterprise applications, enterprise apps, Enterprise apps strategy, enterprise software, fujitsu, Getty Images, Giant Eagle, hootsuite, Indiegogo, JDRF, L'Occitane, Method, NBC, News Analysis, Phillips, R "Ray" Wang;, rwang0, SC Johnson, socbiz, social analytics, social business, social customer insights, social marketing insights, Social Media, social media monitoring, social technologies, Software Insider, SoftwareInsider, uberVU, user strategy, vendor strategy, Wolverine Worldwide.